Photos like this circulate around Facebook constantly. They exist in a plane of shared experience, a collective nostalgia for things that do not matter. Their mission would appear to be building community, a way of saying, “We’re not so different after all.” But in effect, they don’t do that. And this is a problem. But here’s the thing. Recognition of something does not deserve a back pat. You did nothing special. Your brain made a connection to something you experienced in the past. You are, in fact, doing something every healthy, functioning human being has done since the dawn of the species. What are we saying when we repost these things? It invariably goes back to “old is good, now is bad.” But that’s rarely, if ever, the case. Take, for instance, the chair in the picture above, which I only used as a generic example. 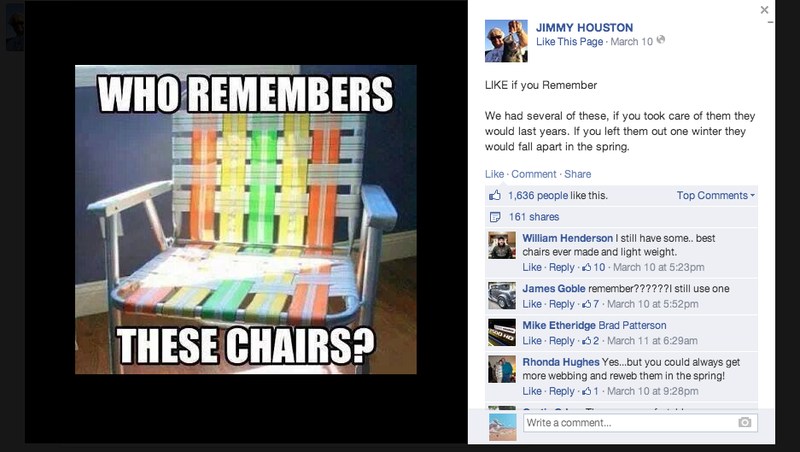 There is someone claiming in the comments that these were “the best chairs ever.” If you like them, that’s fine, but hyperbole doesn’t earn you extra points. The nylon on these chairs frayed and would poke you. They would rust and be impossible to open. They would collapse if you sat back. They are the height of triviality. If they’re so useless, why do we see them daily on social media? That’s plain when you look at the sources of the photos. They almost never originate from a personal account. It’s pop culture websites, sports teams, and anything else vaguely commercial enough to deserve a place on Facebook “Pages.” The more people who look at the photos, “Like” them, and share to their friends, the more attention these companies will get for doing nothing. They get traffic to their pages, which leads to their website, which leads to people buying a product because of a vague recollection of something that does not affect their life. The photos make these commands without offering anything. People extrapolate this to mean their memory will win a prize. If it works on you, the prize is spending your money. If it doesn’t work, there is literally no purpose whatsoever. And this concerns me. When we engage in this blind triviality, we give up some agency. It might not be much, but it’s troubling nonetheless. We’re bored at work, or in class, so we look to something, anything to get us out of our mental rut. In comes this thing which harkens back to a time when you were doing something that isn’t the something you’re unhappy with in the moment, and it gives a glimmer of hope. It makes you more dissatisfied with the present, which makes you want to escape more. But escaping is rarely useful. This is why I watch so many movies and write, and why people crochet, paint, work out, or whatever else. These activities make us think about where we are, what we want to do; they teach (or at least attempt to teach) us something of value about the world. We are creating something when we do them, building the neural connections these Facebook photos only look to lazily exploit. And really, the present likely isn’t terrible. It’s simply here. If you’re unhappy with it, you should engage in what makes you unhappy, then work to fix it. Apply for new jobs, work on a hobby, play with your kids. Just stop blindly following commands from people you don’t know to do something that won’t change your situation.